You may want to put alpha_blend_init() before the main loop. It pre-calculates some magic values which will later be used. Pointers passed to alpha_blend() should be explicitly aligned on 32-byte boundary. In the original formula, the last step should be devided by 255. In order to calculate faster, I use SHR 8 here which is devided by 256. 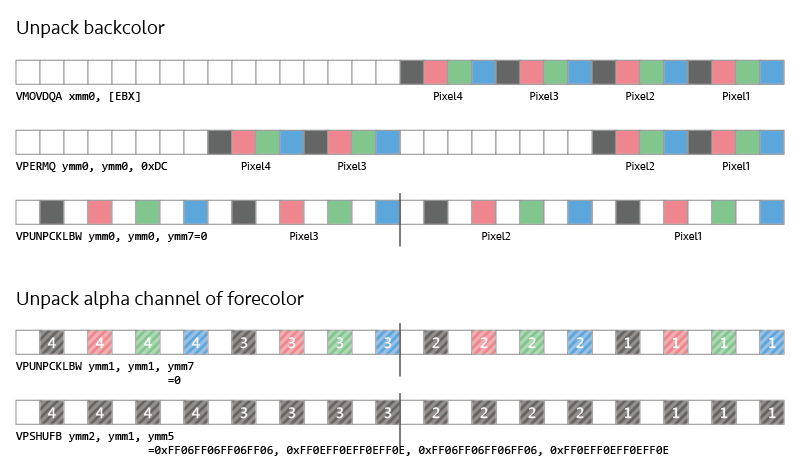 So the composited color channels will be 0x1 larger or smaller than the correct ones sometimes. If you really care about the correctness, you need to correct the formula and modify the code. However if you are using it to render GUIs, mostly it will be fine! Again, my assumption is using it to render GUI on a bitmap (may be in an Operating System). So the calculation doesn't take care about the composited alpha channel. You may need to add extra instructions to fix the alpha channel if you think it matters.